Dave Cole, owner of Epic Brewing. Colorado Gov. John Hickenlooper late last week signed a pair of bills into law that will change how people get their buzz on in the state, including one that will gradually allow grocery stores to sell full-strength wine and beer and another banning marijuana edibles that look like animals, humans or fruit. By far the tougher of the two for the governor to sign was Senate Bill 197, which the former brewpub owner debated right up until the signing deadline. He told numerous media outlets he preferred to leave state law alone and that many liquor store owners had contacted him saying they wanted to continue to fight the big grocery store chains. Sponsored by state Sen. Pat Steadman, D-Denver, and passed with bipartisan support late in the legislative session that ended in May, SB197 (pdf) allows chain grocery stores to obtain up to 20 liquor licenses over the next 20 years and an unlimited number after that, and it also requires them to buy those licenses from nearby liquor stores. 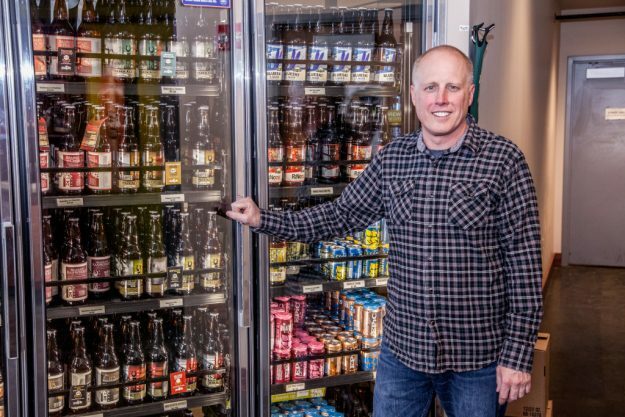 Current law allows only one company or individual to own a retail liquor license in Colorado, legislating that the state’s retail liquor industry must remain small and mostly locally owned. But Safeway and Kroger (King Soopers and City Market) are funding a ballot initiative that would allow grocery stores an unlimited number of licenses next year. Afraid the ballot initiative will pass in November, endangering many of the state’s 1,650 mom-and-pop liquor stores, the Colorado Licensed Beverage Association spearheaded the SB197 compromise that allows grocery chains five licenses in 2017, up to 20 by 2037 and an unlimited number after that. Steadman told Rocky Mountain Post he also prefers the status quo but with the ballot initiative looming, he hopes that over the next 20 years mom-and-pop shops will now either be able to adjust their business models or sell their licenses to the big grocery store chains and not lose their investments overnight. Your Choice Colorado, funded by Kroger (King Soopers, City Market) and Safeway, is still pushing for the ballot initiative that, if it passes, will allow the grocery chains to sell full-strength beer and wine at an unlimited number of locations in 2017. The stores can already sell beer with a 3.2-percent alcohol content as opposed to 6-percent-plus beer. But many craft brewers and small liquor store owners support the bill and hope Your Choice Colorado will accept the compromise legislation. It’s clear that Hickenlooper’s signing of the bill has not stopped the debate. As for the marijuana edibles bill, Hickenlooper signed it into law on Friday, making it a crime to sell pot-infused candies in in the shape of humans, animals or fruit. Colorado requires edible pot to be stamped with verbiage that indicates items include THC, marijuana’s psychoactive ingredient, a regulation that kicks in later this year. The ban on human, fruit and animal shapes, like gummy bears, now takes effect July 1. HB16-1436, sponsored by Reps. Dan Pabon and Joann Ginal, required the Marijuana Enforcement Division of the Colorado Department of Revenue to draft the new rules. Legal marijuana sales are already prohibited for anyone under the age of 21.